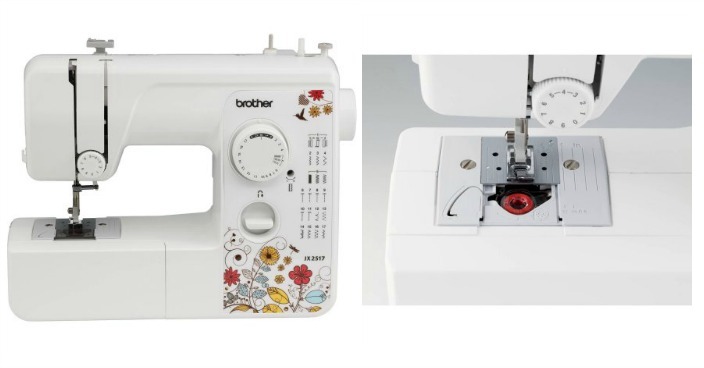 Refurbished Brother 17-Stitch Sewing Machine Just $29.97! Down From $65! You are here: Home / Great Deals / Christmas Deals / Refurbished Brother 17-Stitch Sewing Machine Just $29.97! Down From $65! Right now you can get this Refurbished Brother 17-Stitch Sewing Machine for just $29.97 (Reg. $65) at Walmart! The easy-to-use RJX2517 Refurbished sewing and mending machine is well-suited for both the novice or more experienced home tailor. It includes a total of 17 built-in unique utility and decorative stitches. This Brother sewing machine also contains an automatic four-step buttonhole maker for added functionality. These features all come in one compact, lightweight sewing appliance. This stitch machine even comes with a jam-resistant quick-set drop-in top bobbin, eliminating the need to fish around for bobbin thread. It also includes a brightly lit LED work area. Repair a hem with the built-in blind hem stitch or create a home decor project with the many features of this Brothers sewing machine.